Sweden’s example can help politicians, business leaders, workers, and the public of Central America understand that it is possible to build a competitive society without sacrificing people’s well-being. In a recent interview with Bloomberg, Swedish finance minister Magdalena Andersson, who has managed Sweden’s public finances since 2014, spoke about the three principal factors that have led to Sweden’s successful integration into the global economy as well as one of the highest standards of living in the world: job creation, a robust social safety net, and wealth redistribution. 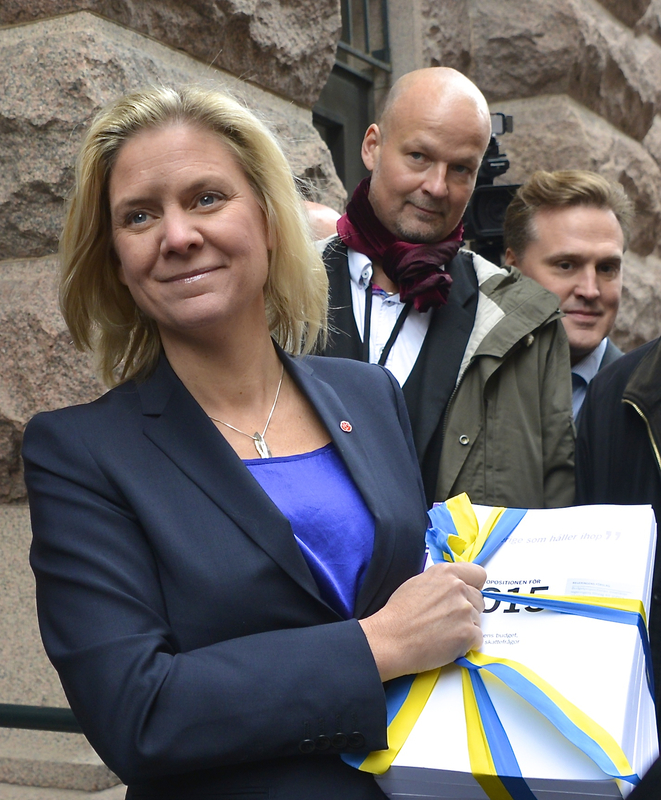 Swedish finance minister Magdalena Andersson, 2014. Courtesy of Frankie Fouganthin. It’s helpful to review Sweden’s accomplishments since 2014. First, Sweden’s economy averaged 3.1% real growth from 2014 to 2017, 55% higher than the average over a similar period for the most advanced countries in the Organization for Economic Cooperation and Development (OECD). (35 of the biggest economies in the world, including the US, Mexico, and Japan, are part of the OECD.) Sweden also has a trade surplus of 4.9% of GDP, while the OECD average is 0.3%. As for the workforce of 5.2 million people, 47.4% are women, which is the highest rate of female participation of all OECD economies. The unemployment rate fell from 7.7% in the fourth quarter of 2014, to 7.1% in the fourth quarter of 2016. According to Andersson, the high participation of men and women in the labor market is related to accessible childcare and loans to parents financed by taxes. On the other hand, the Swedish economic model allows businesses to fail if they can’t compete. This pragmatism, however, is complemented by a strong social safety net, training for the unemployed, and active labor market policies. It’s important to note that 25.8% of the Swedish labor force (1.3 million workers) works in the public sector, and that in 2015, 72% of public workers (966,000) were women. Clearly, fiscal policy is a tool that allows these factors to work toward social well-being and development. In 2015 the Swedish government budget represented 50.2% of GDP. Social safety net spending (41.6% of the total budget) accounted for the largest share of the budget, followed by general services, education, and health spending. Graph 1: “Sweden: Central government revenue and public spending, by principle categories, 2015. In percent of GDP.” Source: Icefi, based on Statistics Sweden and OECD statistics. The blue section of the graph shows “Public Spending” by spending categories: Social safety net; Community, environmental, and general; Education, recreation, and culture; Health; Economic issues; Public order and security; and Defense. The yellow section shows “Government Revenue” by tax categories: Income, profit, and capital gains; Goods and services; Social security contributions; Payroll and workforce; Property; and Other taxes. The final category is Non-tax revenues. The bottom section shows overall balance (surplus or deficit). Also in 2015, the total revenue of the Swedish government was 50.5% of GDP, while tax collection represented 43.1% of GDP. The tax structure has three major pillars. First, taxes on income, profit and capital gains represented 35.8% of total revenue in 2015; taxes on goods and services contributed 30.3%, and contributions to social security and payroll taxes contributed another 35.4%. The scope of Swedish fiscal policy allows for significant redistribution of income, through both public spending as well as through taxation. The majority of households pay taxes and receive benefits according to a progressive structure: those with lower incomes receive more benefits and vice-versa. Graph 2: “Sweden: Income redistribution through taxes and benefits, by income level, 2013.” In 2013 US dollars. 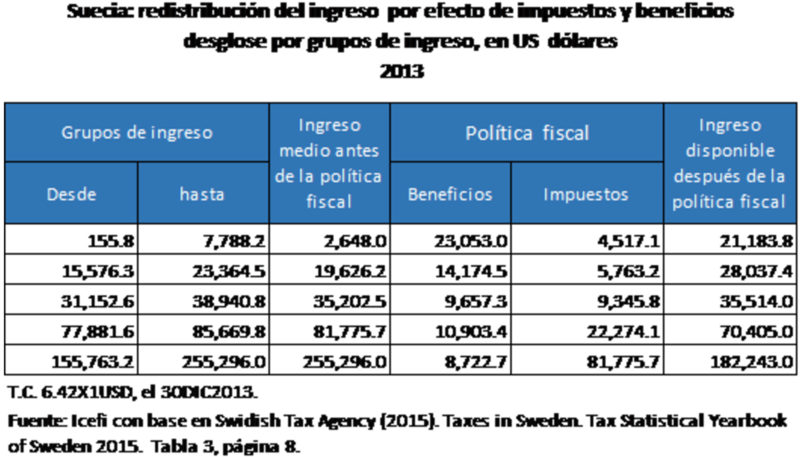 Source: Icefi, based on the Swedish Tax Agency’s “Tax Statistical Yearbook of Sweden,” 2015, Table 3, Page 8. The graph shows (from left to right): Income level (broken down into minimum and maximum income cutoffs); Average income before taxes and benefits; Application of fiscal policy (broken down into Benefits and Taxes); and Average income after imposition of fiscal policy. The numbers challenge the economic theory dominant in Central America: that economic success depends on maintaining a minimal government; minimum spending on social programs and safety nets; and a focus on maintaining favorable macroeconomic conditions, with unemployment rates and wages that fluctuate according to the competitiveness of production compared to the external market. On one hand, Sweden is positioned among the 10 most competitive economies in the OECD, according to the 2016 Global Competitiveness Report. The 2017 economic liberty index by the conservative Heritage Foundation ranked Sweden 19th of 180 countries, beside the US (17th) and ahead of countries like South Korea (23rd) and Germany (26th). This demonstrates Sweden’s high degree of economic openness, its solid regulatory efficiency, and its highly valued legal constancy. In the 2017 edition of Doing Business, a World Bank publication that measures whether or not countries’ regulations favor economic activity, Sweden ranks 9th of 190 countries. The 2016 Human Development Index (HDI) report ranked Sweden the world’s 15th most developed nation. Transparency International’s most recent corruption perception index ranked Sweden among the five countries with the lowest levels of perceived corruption in the world. Meanwhile, public opinion research carried out periodically by the Swedish tax authority about the country’s tax system has found that 40% of the population and 39% of businesses are happy with the tax system (in terms of its structure, rates, and rules); that another 35% and 39%, respectively, are not opposed to the tax system; and that 25% of citizens and 22% of businesses disagreed with the tax system. First, democracy must be shaped not only in the political arena, but also in the economic and social arenas. Second, a strong sense of community must strengthen principles of solidarity and equality. Third, socioeconomic equality and economic efficiency are complementary, not contradictory. Fourth, social control should be exercised over the market economy. The market is a mechanism for the distribution of economic resources, but conditioned by economic policies based on productivity and innovation, wage policies, progressive taxes, and social policies. Finally, the public sector should be used to broaden freedom of choice. Through social policy, citizens’ security and freedom improve. For example, pensions reduce the risks of old age, and housing policies limit shanties. Sweden’s example can help politicians, business leaders, workers, and the public of Central America understand that it is possible to build a competitive society without sacrificing people’s well-being. It also helps to reflect on the important role that public administration should play to bridge individual interests with national social and economic agendas. Finally, one can’t forget that fiscal policy expresses what kind of society is being sought. That’s why it’s so important to promote in Central America new solutions to the economic, political, and social challenges that are expressed in the amount and method of tax collection, in public spending, in how development goals are set, and in ways to ensure accountability. 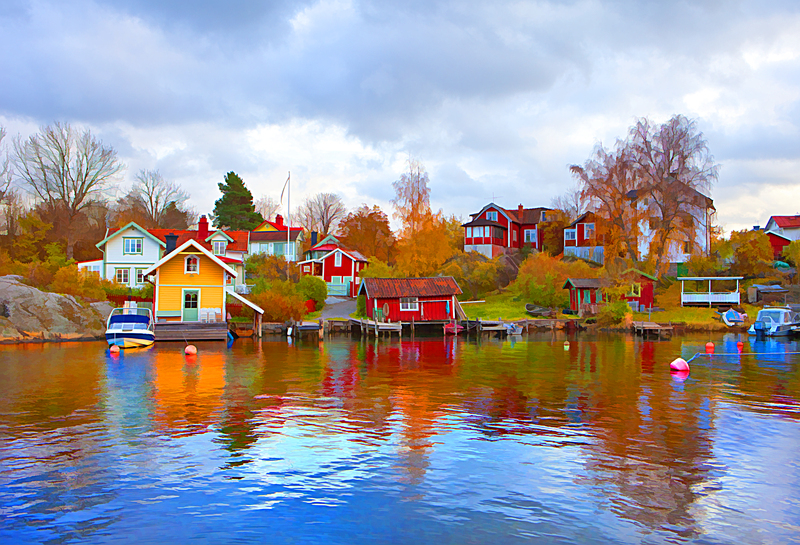 A waterfront in Vaxholm, Sweden. Courtesy of Bengt Nyman.